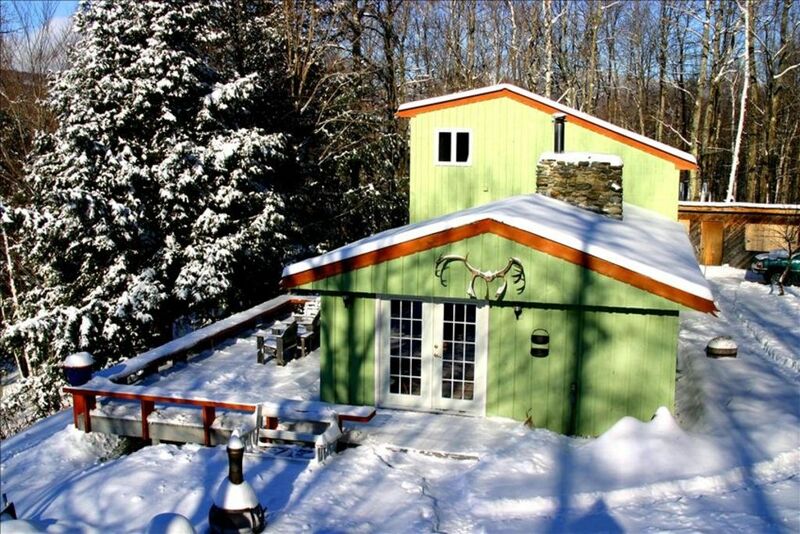 Nestled in the woods looking up at Camels Hump is our cozy little cabin. A perfect getaway spot with unsurpassed views of the mountain. Camels Hump is Vermont's highest peak that is not developed by a ski area. It's all wilderness. Feels like you’re a million miles away but it’s only a 15 minute drive from town and 4 major ski areas, Stowe, Sugarbush, Mad River and Bolton Valley are about 1/2 half hour away. Camels Hump trail head is right down the road for access to awesome hiking, backcountry and XC skiing. Very rustic but with all the amenities. It’s really not so little - about 1800 sq ft. with 2 bedrooms, large living room with massive fieldstone fireplace, spacious kitchen and well appointed bath and a toasty woodstove. The upstairs master bedroom is huge with a king bed and large sitting area and frenchdoors leading to a small balcony. The downstairs bedroom is large also and has a double bed and a twin. Amenities include washer/dryer, propane heat, all cookware and linens. Although the roads are very well maintained 4 wheel drive or AWD are recommended in winter months or mud season. The Cabin is 7 miles from town. John is an Innkeeper - he runs the historic Old Stagecoach Inn right in town. He is an outdoor enthusiast: skiing, fly fishing, mountain biking, canoeing, hiking etc. He can provide a wealth of knowledge about these surroundings. I had been intrigued by this property for years - the view, the proximity to Camels Hump trailhead and the feeling of seclusion while only being a short drive from town all made the cabin my favorite spot. One of the most awesome views of Camels Hump available anywhere! There is no cable or TV reception up on the mountain but we do have Blueray DVD player and large flat screen TV. The house and owner were terrific. A couple of disappointments ........ wood stove in kitchen is no longer there, the stone fireplace now has a wood stove like insert requiring glass door to be closed at all times while lit, the TV is upstairs in a bedroom instead of the living room and there is no cable but you can stream. Overall the house is very comfortable and we had a wonderful stay. While the weather left something to be desired, the cabin and the host did not disappoint! The cabin is stocked with everything you need, the fireplace is a treat, and the views really are amazing. Thanks to John for being such a gracious and attentive host and to sharing this special place with us! Glad you could join us Karen. We hope to see you again sometime soon! Great house, very comfortable yet rustic in the style of the area. The hosts are excellent, contacting us to ensure everything ok during our stay. A great find! The owner took us to the cabin and walked through the amenities. It had everything we needed to enjoy a 4-night stay. The weather did not cooperate, but it did not spoil our time or our stay in the cabin. A little crowded with furniture, but the water was hot for showers, the heat worked, the fireplace was great, the kitchen accommodating and it was just what we were looking for in a stay in Vermont. Thank you John! The house was perfect for us and had what we needed. The view was wonderful and the sunsets even better! Enjoyed the relaxation of this great cabin in the mountains. I really enjoyed bringing my dog and letting them run around the yard and enjoy the low maintenance home. Really glad you had a chance to visit the Cabin. As you said - a great place to relax and enjoy the beauty of Vermont - dogs love it too!